Do you know Bro. Jon Isaacs and his beautiful family? We first met Bro. Jon when he was a young man and relatively new Christian. He was raised in Connersville, Indiana and would visit our home church, Dryden Rd. Pentecostal Church in Dayton, Ohio. He was a fine young man then and God has touched him and used him greatly through the years. Bro. Jon is married to Sis Heidi and they have three beautiful daughters, Alayna, Alivya and Anna Kate. They were effective evangelists for several years and have been Pastoring near Elba, Alabama for nearly 12 years. When they went to Zoar Holiness church I really wondered why they would leave the road. After 12 years, a new location, a name change and many lives transformed by the power of God, I now understand why they went to Zoar. It is evident that God sent them. Grace Fellowship Holiness Church (The church is no longer at Zoar, hence the name change) is better because God sent them this special anointed family. God is using them to reach folks and to bless. They all sing, play music, preach, teach and obviously have a heart for people and a heart for God. The girls are precious and have taken up the work of the ministry with dedication and delight. It is a joy to watch this family work for the Lord and minister to His people. Bro. Jon invited us to Zoar in the early years of their Pastorate and we have enjoyed great fellowship with his family and with the family of God that attend the church. Our lives have been made better by knowing them and we look forward to many more years of friendship by God's grace. Some of our most precious memories of evangelism were made with these folks and we will treasure them for a long time. The Watch Night service on January 31, 2010 was especially memorable and will stand as a great memorial to God's amazing power and blessing, at least to our family. 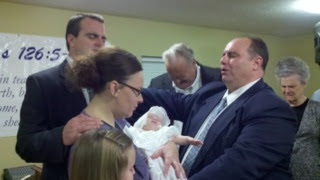 That night was also special because we were honored to dedicate Anna Kate Isaacs to the Lord. 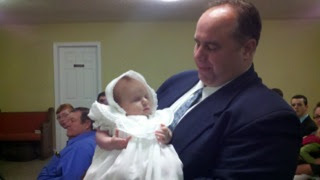 Here is Anna Kate now with me and one of the little boys from the church. Praise God for His wonderful people that we are blessed to know and love. These are a few more of them that are near and dear to our hearts! Do you know Bro. Jon Isaacs and his beautiful family? They are definitely worth getting to know.